Breakout the rave attire, rainbow necklaces, and tell your friends that the beloved Desert Hearts friends will return for another warehouse takeover from Teksupport on November 17th. Mikey Lion and will be joined by none other than “Papa” Lee Reynolds, “Papa Bear” Marbs, and Porky along with special guest Doc Martin. Attendees should expect a couple of surprises. The Desert Hearts crew had an monumental summer season along with solid new music that is taking over the house and techno scene. Everyone that attends Desert Hearts event knows that once you see a show you are part of the family. “There is no Desert Hearts without the Family”, nothing but great vibes, incredible music, and fun times with the Family. Recently Mikey Lion proposed a no camera/ no phone party with the Desert Hearts community, so instead of people being on their phones, people will actually witness performances and make memories instead of viewing through a phone or camera making Desert Hearts events even more special and stronger. 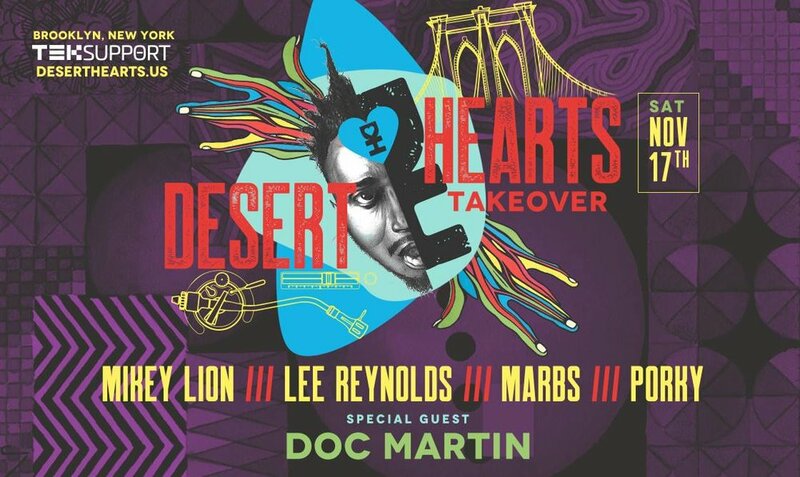 Dance and party with your favorite crew Desert Hearts, it’s been awhile since the Family has been to New York and everyone is excited to party again. TICKETS will be available to purchase on Thursday, September 20th at 5 PM EST.